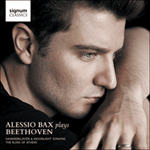 Alessio Bax complements the hallowed sonatas on this disc with his arrangements for piano of two theatrical selections: the Chorus of the Whirling Dervishes and Turkish March from Beethoven’s Die Ruinen von Athen, Op 113, incidental music to August von Kotzebue’s play. This, along with Beethoven’s incidental music to von Kotzebue’s König Stephan (celebrating Hungary’s founding monarch), was commissioned for the opening of the new imperial theater in Pest in 1812 by the reigning Emperor Franz. The Ruins of Athens tells the story of Minerva, daughter of Zeus, awakening from a two thousand-year slumber to find Athens occupied by the Turks; ancient Greece is no more, but—praise ye gods!—the spirit of its enlightened culture lives on in Pest, preserved by the benevolent Franz. Aside from the blatant sycophancy, the obvious cultural problem, specifically pertaining to the Chorus of the Whirling Dervishes and Turkish March, should not be swept under the rug. This is musical Orientalism, and it was hardly a novelty. The Western fascination with 'Turkish' music around the turn of the nineteenth century was a sufficiently real phenomenon that pianos were manufactured with Janissary stops; hits like the Rondo alla Turca from Mozart’s Piano Sonata in A major, K331, could be enhanced by a pedal that rang a bell and struck the soundboard with a padded hammer, imitating a bass drum. Witness, too, Mozart’s 'Turkish' Violin Concerto, K219, and comic opera Die Entführung aus dem Serail, set in a Turkish harem. Even the 'Ode to Joy' from Beethoven’s Ninth Symphony, that utopian vision of universal brotherhood, has its share of Turquerie. But accepting the distinction between historical context and sheer compositional imagination, we can appreciate the magnitude of the latter in this music. The Chorus of Dervishes—essentially, Opus 113’s bad-guy music—is, in any event, a thrilling conception. The strings surround the chorus’s martial proclamations ('In the folds of your sleeves / you have carried the moon and shattered it. / Ka’abah! Mahomet!') with rapid triplet figures, evocative of the well-known whirling dance associated with the Sufi Dervishes. The Turkish March, probably one of classical music’s most universally familiar melodies, is much more benign in character, and equally appealing. Beethoven got much mileage from this irresistible tune: three years prior, it had served as the basis for his Six Variations on an Original Theme for piano, Op 76.